A few experiences are mentioned herein below, of those who have truly felt touched by His Grace and felt the benedictions of His Presence in their lives. May this provide inspiration to all who read it. May they find His Presence guiding them and protecting them providing the aspiration in their lives, helping them to reach closer towards the fulfillment of their purpose and existence. I woke up one morning as usual and noticed I am suddenly running a high fever. At first, I brushed it off as a normal flu, but within a few hours I realized that the fever had nearly crossed 104 degrees. Now my family was worried, and rushed me off to a doctor, who conveniently ordered a million blood tests to be done and prescribed a few general medicines. The results came out the next day, and surprisingly the pathologists believed that I was absolutely normal, and I should be running around town, but my body was still running temperature at 104 Degrees, and this was surprising. And soon, I began to feel a strange heaviness in my body, as though something or some evil force had attacked me or was on me. I continued to take the medicines but my condition continued to deteriorate. It’s almost as though, every time I breathed, it became more and more difficult. By the fourth day I was confined just to my bed and found it difficult to even turn over, or wake up to use the bathroom. So on the 5th day I realize that this isn’t a normal medical condition, it is some unexplained force and a life threatening situation. I had been running a temperature, of 104 degrees fever, non-stop since the last 5 days. And ‘Now’ I began to worry, and started chanting “Yogi Ramsuratkumar Yogi Ramsuratkumar Yogi Ramsuratkumar Jaya Guru Raya” anxiously (aggressively). These words that were on the back burner for such a long time (regretfully) for my life were ‘Now’ the only words I started uttering. I began to feel the difference. I suddenly experienced ups and downs in the physical conditions of my body, as though somebody were fighting this evil. I felt a battle going on inside and felt the warmth of the Guru. I became aware of Yogi Ramsuratkumar’s Presence for the first time in 11 years. At this point, I realized His Grace and Power and became absolutely confident of recovering from this affliction. My family decided to shift me to a hospital the next day. Those fellows continued to use me as a guinea pig and perform tests after tests. The results were amazing, I was absolutely normal as per their results! I still had a fever, but I was much stronger from within, as though somebody recharged me. I felt better and better, and after spending three nights in the hospital I was discharged. I had miraculously survived 6 days of such high fever without a single consequence. I came home and I was feeling lighter, feeling different and failed to understand what ‘this difference’ was. And ‘this difference’, later I realized was that I had just witnessed HIS Power and HIS Grace and that’s what ‘this light bubbly’ feeling was. I began to lead my life normally again and was humbled and amazed by the Grace and Power of Yogi Ramsuratkumar. Now, chanting His name has become a second nature. I keep taking it, or rather attempting to take it 24x7. This ensures, whenever I realize I am not, I start to chant again. The Name is one of the most powerful weapons as seen above. It gives you so much strength, clarity and peace. You are guided at every step of the way. By leaving every decision, or rather your life at His Feet, ensures ‘the best’ for you. His love for you is the most(He loves you the most). He takes your life not only in a good direction, but in the best possible direction. There is nothing better than what He chooses for you. And to live with this confidence, is just an overwhelming feeling. It is not easy to describe, but it’s like a cocoon, like a warm shelter. It’s absolutely amazing. The Name is what you begin to take thinking it’s the Name of an individual or the Name of the Guru, but soon you realize it is ‘That Name’, the Name of this world, this Universe, the ‘Name’ is all that there is. The Name does another thing, it makes sure you take the path (which we may not realize is the BEST), that HE wants, and not the path which we intellectual folks believe is right. Thus, chanting the NAME is best and least we can do. The Guru’s Grace shines upon us through the toughest times in our lives, and has a special way of always reminding us, no matter how ignorant we are, that it is HE who has the final say, and it is HE who is always there, and it is HIS love that is the most profound and sweetest in our lives. The love and affection that I feel for Yogi Ramsuratkumar, is that of a small boy’s love for his mother. The small boy loves his father, his friends, his family, everyone, but has this very special place for the Guru. It is that love I feel. Today, I am this normal 20 year old boy with a normal life, but have this understanding, sight and clarity that very few 20 year olds have, this privilege of having. I am able to judge situations and people. I have this sense of peace and calmness that I believe only HE has provided. This other experience I had a few days back, I had a strange dream one night, in which I see that the brakes of my car have failed. This is the same car I have been driving for the past 6 months. The car had been making a strange sound upon braking. Since the last week, I had ignored this. After the dream, I had a mechanic take a look at it and he said there was an issue which he then rectified in time. This just reiterates my point, that no matter how ignorant we are, Yogi Ramsuratkumar always has His way for my best, and His timing is not only right but it is PERFECT. Early 1998, I am in the street and see Yogi Ramsuratkumar’s car. I stop and wait as the car slowly comes. It was on the morning of 20th February, 2001, after Bhagwan had already taken Mahasamadhi. Speculating on the sense of loss that felt of not being able to have the Darshan of His physical Form, with a very weighed heart and a reluctance to move away from His seemingly asleep physical Form, I and my friend decided to go and have some breakfast since we had not eaten for over fifteen hours. We decided to go to Seshadri Ashram canteen to have an early morning breakfast. Both of us were feeling extremely depleted, hungry and depressed. We continued, and as we were about to enter the canteen, we saw a Beggar. In that moment, something happened. He looked straight into our eyes, unmoving and intentionally. Both me and my friend, we looked at each other and we thought, “Could it be possible?” that Yogi Ramsuratkumar would still reveal His Presence. We entered the canteen and sat down on the table and ordered our breakfast, unwilling to discuss what we felt a moment ago. At that very moment, this beggar stepped into the canteen and was again looking at us, intentionally. The cashier of the hotel took notice of his presence there and tried to usher him out of the premise. At that very moment, my friend called out to the cashier and told him to give the beggar whatsoever he wished to have for his breakfast. The beggar came and sat at the table adjoining to where we were sitting. We all remained silent, not knowing what to expect, not knowing what to accept. After a while, the beggar finished his breakfast and got up to leave. At that moment, my friend got up to give him a little money. I was a little skeptical, mainly due to the fact, that the Guru always prepares His disciples, to go beyond the Form into the Formless, to look beyond the reality of the Guru’s body into the Truth of His Presence. Hence, I was quietly watching the entire scene unfolding in front of my eyes. By this time, my friend had already given some money to the beggar and the beggar had started walking out of the hotel. At that very moment, a thought arose in my heart, “Bhagwan, is it really You?” Instantly the beggars form stopped moving, right at the doorstep, and he turned behind, looking over his shoulder, straight into my eyes affirmatively, with a tiny wrinkled smile on his lips, looking at me from the farthest corners of his eyes, watching and waiting. I found my hands coming together in ‘pranam’, offering an obeisance and prostration to my Guru who always is, in all forms as the Formless. The Guru never dies. Long Live Yogi Ramsuratkumar! “YOGI RAMSURATKUMAR,” the very instant this Name rings in consciousness, my heart jumps with joy and at the same time, humbly surrenders itself to the Divine Presence that takes full control. “YOGI RAMSURATKUMAR,” this Divine Name, this Holy Name, is indeed the very Name that has come to all of us as a Blessing, as a sweet nectarous gift from the Supreme Lord Himself, the Supreme Father, Supreme Mother, so that we might chant it, remember Him and rejoice as One, in the Glory and the Mysterious Dance that He truly is. My heart leaps like a little angel with wings, and a broad smile automatically manifests on my usually serious face, recognizing the magnanimous Presence that is the very substratum of our existence. Initially, like a young child, we turn to Him, as if we were standing before the vast endless Ocean Mother, and shyly dip our toe fingers into her cool soothing waters. And then most delightfully, run back towards the shore, knowing She touched something deeper within than just the feet. Then like young ones, all grown up, we seek refuge in Her, dive into Her endless blue waters, swimming into Her unknown vistas, until all the burdens, all the troubles hidden deep within the recesses of our being, wash themselves away. And then finally, the grand day arrives, when we drown into the Ocean, not knowing anything, not thinking, but just letting go of all else and allow Her to take us into Her as She wishes for us to, surrendering all in Her hands, so mighty, powerful and all encompassing! Such is the Grace of My Father’s Name, that drowning is the Only Way! There was one time when I had travelled to Haridwar along with my husband for a short while, both of us had received His Blessings and Consent before we left and therefore, were certain His Grace would take care of everything that lay before us. After a few days stay in Haridwar, we intended to travel to Hrishikesh for the rest of our trip. However, due to the heavy rains and severe downpours, it seemed close to impossible to proceed any further. Still, stubborn and persistent as we were, we decided to move forward, not having the slightest clue as to what a huge mistake we were about to make! With loads of luggage on our backs and in our hands, we left amidst the initially gentle raindrops with the Faith that Bhagawan would look after everything. All of a sudden, light showers turned into an extremely heavy downpour because of which there was no way we could reach a bust stand and catch a bus. Somehow drenching ourselves, we managed to make it to a rickshaw stand. And to our great horror as well as relief, there came before us, our only option, like a messiah, a tuk tuk that held so many people in it, it was almost impossible to sit inside! Somehow dumping our gigantic bags in the tiny available corners of the rickshaw, we sat on the seat, ready to move towards Hrishikesh, however we could. To make matters worse, there was a woman with two children sitting before us. One of the two children was severely ill and would repeatedly vomit out of the window! Despite all odds, by Bhagwan’s Grace, we managed to reach Hrishikesh, but since it had already become very late at night, the driver forced us out of the rickshaw, in the middle of the town, unwilling to take us any further! Although we frantically searched for some transportation, there seemed to be no hope coming from any side. Suddenly I heard my husband saying out aloud, “Bhagwan loves to trouble me! This is how He treats us! He can do so much for everybody, we can’t He help us now?” My temper had shot itself beyond its limit of control and I couldn’t seem to hold myself back either. The very next moment, from nowhere, a rickshaw arrived right beside us and eagerly took us to our destination, higher up towards Ram Jhula in Hrishikesh. However, due to the late hour of the night, no hotel would give us a room, but by the help of this rickshaw man (who had Sai Baba’s Name written on His rickshaw), we managed to find a room further into the valleys, where the first thing that I could hear was the Name “ Om Sai Namo Namah” sung by the waiters sitting at the entrance of the reception. The night passed by and the very next morning, my husband left to find us a room closer towards where we needed to stay. I found myself alone in the room, wondering what I was to make out of this wild adventure that existence had played out. Soon after I opened the door of the room, with a cold already catching on, I found myself awe struck by the beauty of the mountains that stood unmoving before my eyes, almost like a painting. My husband returned and we walked towards the reception of the hotel to inform them about our check out. On the way, one middle aged man, rather simple hearted, greeted us and very kindly spoke with my husband as if he knew us well and wished to help us in whatever way he could. Instantly my husband and he got along very well and began strolling ahead of me discussing something between themselves. I quietly seated myself on a chair and gradually, gaining some composure, turned my attention within and started to whisper, “Bhagwan, you promised! You would take care of everything. You said you would be with us. You are My Father and I know, You will never let us down…” And then I heard resounding within my heart, the Divine Name “ Yogi Ramsuratkumar, Yogi Ramsuratkumar, Yogi Ramsuratkumar, Jaya Guru Raya” For a while I sat there in this way. That’s when it all changed! A deep silence and tender peace took over. It felt almost as if He Himself, were smiling at me, reassuring my heart that He s there, to hold everything together and look after everything. Soon, my husband returned, broadly smiling, and gleefully looked at me, saying, “It’s done!” it turns out, not only did this kind gentleman took care of our transport but also reduced the rent for the room that we stayed in. Furthermore, he asked for some people to help us with the luggage and ensured that we could leave at leisure without having to worry about the check out time. Everything, including a wonderful room was arranged for us. All through the trip in a miraculous way, Yogi Ramsuratkumar looked after all our needs and ensured that we had one of the most memorable trips of our life! To speak about Yogi Ramsuratkumar, through our experiences, is like trying to write an endless infinite story and fit it into one page, or like taking a mug and trying to empty the entire ocean from it! For All Life, once claimed by Him, totally and wholly, belongs to Him alone. He is All Life; He is everywhere dancing in His Own Glory. Few have the Grace to acknowledge and recognize this and those who do, are indeed Supremely Fortunate, for they received the Greatest Blessing of all by none other than the Master, the Beloved Himself. Good, bad, difficult, easy, favourable, unfavourable, all are Him and His Grace alone. He is the Supreme One, revealing Himself through this marvelous mystery called life. Taking His Name is Loving Him, rejoicing In Him, Glorifying His Majesty, enriching His Happiness and ours and fulfilling our lives; as His to claim. Jaya Yogi Ramsuratkumar Jaya Guru Raya! May His Name Ever remain within the hearts of His Children, those dear and near to Him! My Name is Ram Kumar, residing at Chennai, South India. My father and mother have been with Yogi Ramsuratkumar from the year 1973, because of their prayers to Bhagawan, I was born in to this world by His shower-full blessings, grace and love, in the year 1980 on 10th of December. There are number of miracles that have happened in our lives as devotees of Yogi Ramsuratkumar. We have experienced numerous such miraculous occasions. But here, I am going to share the incident that has happened in my life on 09 September 2012. This I am sharing with you all because one of my friends has requested me to do so for Him. My matrimonial life is in terrific trouble, and I am living alone with my parents. My only son - the lovable kid of the house is with my wife. Because of this problem, I have lost all confidence in my life, not being able to work properly at office, sometimes shouting at others and sometimes crying to myself. Now my position at office too, is in some problems. By seeing my emotionally sensitive and unsound nature, my lovable parents worry a lot for me and as a result have become more sick and weak. In the early days, Yogi Ramsuratkumar said to my father that, “When you are in trouble shout loudly my Name and this beggar will rush to your place for help immediately.” Also Bhagawan said on numerous occasions, so many times that “Whosoever is talking about this beggar, I will come to that place in the form of a Butterfly and bless them.” This is ‘True’ and has happened in the lives of so many devotees. Immediately by seeing all the commotion unfolding in front of him, my father loudly shouted “Yogi Ramsuratkumar Yogi Ramsuratkumar Yogi Ramsuratkumar!” three times after that, I left for the Temple to have darshan of Sai baba. During the time I was there, after the Darshan at the temple, they (priests of the temple) gave me two yellow color garlands and sweets as prasad. One flower lady came and gave me a bunch of Jasmine flower garland and said “This I want to give it to you.” The Temple manager asked me if I had ever been to Shirdi to which I said no, he then said that “I will take you to Shirdi after 2 months when I am going.” All these incidents unfolded after the Darshan. All these happenings gave me some hope and brought some courage for my life, after such a long time. After reaching home, I shared all these experiences with my father and mother. They felt better hearing about the incidents and were happy. We all got good sleep that night after a very long period. But I still prayed to Bhagawan that night, I asked Him do something about the problems that we were facing and begged Him to put one ‘full stop’ to all the problems and then I went to bed. Next day on 10th Sept 2012 in the morning at 5.00 am when my father tried to open the main door of the house, he saw one Butterfly just sitting on the padlock of the door. How the Butterfly came inside the locked house? That too in concrete building Apartment! It was not allowing my father to open the door and was flying around the padlock for quite some time. Immediately my father knew that his friend ‘Yogi Ramsuratkumar’ had come to meet him. Dear devotees and friends, Bhagawan used to call my father as his friend and would address him as “MY FRIEND” always. Witnessing this, my father just sat on the sofa seat and start chanting ‘Yogi Ramsuratkumar’. After 10 minutes the butterfly flew and settled itself above a big Photo of Bhagawan up on the pooja altar – that is daily worshipped in our house. Once the butterfly sat there, then my father opened the door. The Butterfly was at our place, until 12th Sep 2012 up to 5.30am, and was still at the same place sitting without even moving an inch, above the Big Photo of Bhagawan. Then early in the morning, when my father opened the door of the house, it just flew away from there. I have much faith Now that very soon my family going to earn from Yogi Ramsuratkumar all the lost happiness and the lost good health and also an end to the separation from my only son. Yogi Ram Surat Kumar Jaya Guru Raya. As usual, I left in the morning at 7.30 am to go to the Office. When I got out of my building gate, I saw a car had been badly damaged by some accident, and the first thought that came to my mind was ‘What if I meet with an accident?’ I ignored this thought and carried on with my journey! I was driving fast at my usual speed of 80-100kmph due to lesser traffic conditions. Since I have to reach Office by 8.30 am I started racing the car from 80-100kmph to 120kmph! When I was racing at 120kmph something within told me I shouldn't be doing this but by the time I could truly respond to the inner prompting, my car tire burst and the car went completely out of control. I tried to brake hard to stop the car from skidding further but the car hit the railings of the road on my right and bounced off it nearly 3-4 times within a span of 30 seconds. Somehow in those crucial 30 seconds, I started to subconsciously chant ‘Yogi Ramsuratkumar Yogi Ramsuratkumar Yogi Ramsuratkumar!’. The car kept on skidding and I had lost total control of it, finally the car suddenly jerked and stopped! I was totally disoriented by now but I managed to get out of the car trembling and shaking terribly! To my surprise even then I noticed I was absolutely fine and not hurt even a bit, not even a scratch on me, even the car wasn't damaged much as expected. To someone who saw me after this incident they would probably believe it to be a case of simple tire puncture. Only I know in my heart what I went through and what really saved me! The chanting was still on in my mind and I thanked Him ‘Yogi Ramsuratkumar’ a million times for saving my life so miraculously! I called up my son immediately for help who came to my rescue in 30 minutes. In the meanwhile two young boys had stopped their car to help me out and shared a few helpline numbers. Again it was ‘Yogi Ramsuratkumar’; who ensured help and a policeman came by and called somebody to change the tire of the car. All this got over within an hour or so. I felt normal again and was feeling fresher too. I also felt more courage to drive back to my Office and carry on with my work which in normal circumstances would not have been possible for me to do so. This was only possible due to the grace my Guru "Yogi RamSuratkumar". In those 50-60 seconds of my life, I now realize the value of my life and the abundant Grace that I am blessed with by my Guru. Whosoever I have narrated this story to, was shocked to still see me alive. If the Guru wishes anything is possible. I am deeply grateful to Him for this Grace. I also learned that one must listen to One’s Self however insignificant it may seem and heed to the Inner Call. Somehow this incident has left me feeling much lighter and freer as though some burden has left my soul. 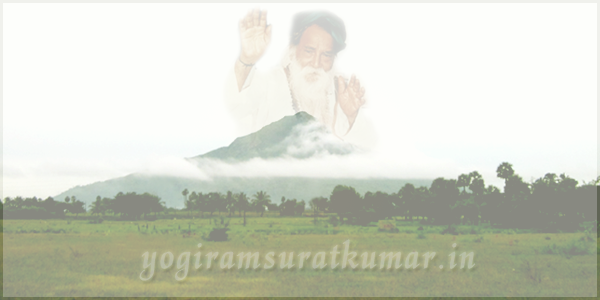 To have come into the Presence of our precious Guru - Yogi Ramsuratkumar, was the beginning of a new life. To speak more accurately, it was to being awakened into a life of Grace, where everything, everywhere, speaks of His Love, His Touch, His reassuring protection and kind solace, where after so long Heart can rest in peace , at last – I am Home. Ofcourse, the touch of the Guru in one’s life, understanding the nature of truly ‘Being,’ is not something that I can wholly understand or comprehend, but out of His endless ways and His Endless Being, there were two things that always felt to me, to be His ‘signature,’ whereby one would be distinctly and precisely aware of His Presence and His Will. One is a very deep Love for all and everything, and a life which is based on the understanding that arises out of love. True love that never judges, expects, or demands, but rather, love that always keeps a place within one’s heart for forgiveness, for acceptance, for change. Love that silently watches, observes, learns and abides in itself more and more. On the surface nothing happens, but inside there is this quiet recognition of the Supremacy of Love. The other thing is a very gentle, sweet and unique sense of humor where by which if one has really kept oneself open and receptive to know, taste and experience the majesty of His Grace, there unfolds a simple and unique play bringing one back to oneself. Of course, nobody around would be, in the slightest way, aware of what is truly playing itself, only the one who is concerned. It always felt as if He likes to show and teach through humor, but a very unique one. One time, during evening, I was pushing my bike, with an empty tank into the petrol pumps, perspiring and was straining my eyes when they suddenly fell upon an elderly beggar. Firstly, although it was dark, my sight locked themselves on the nails of his finger toes which seemed very long, curved down and extending beyond his toes. Sometime afterwards, I was sitting in the street, once again waiting for my good bike to be repaired. Hot, sunny and noisy as it was, my mind was moving from “this to that”… Remembering Bhagwan, again this thought came, “now it is time to know Him in all and everything.” Just as this thought appeared, suddenly, my sight sense became very sharp and by itself focused, without any intention from my side, on a figure that was standing quite far next to the wall on the other side of the street. As I realized this person was attending the call of nature, I moved my eyes away, and “out of my mind”, but soon this person was crossing the road, and I recognized him as the same beggar from the petrol pump, and before I know he came and stood in front of me, close by, with his outstretched hand. Again this impression arose in me, how much his appearance was dirty… with the understanding that God is not confined to our ways, and ideas and expectations. He is in us all, always. Whatever lesson and understanding one has to “take to heart”, the way in which it is shown always filled me with wonder, as if this whole world is His own cinema studio. Speaking of Bhagwan so freely, one has to be a little foolish. May it also bring His Grace and precious Love into our Hearts. May we all dwell in our Hearts at Bhagwan’s Holy feet and His sacred Name. It was summer 2009, it looked like any other year but some things felt different though. Clients were getting more demanding, the heat was getting unbearable and like most working people, I wanted to take a break. Even in the midst of all that stress, somehow I was able to feel more grateful, more at peace with myself, maybe it was how my life was going, and everything was great especially with a ‘bonus grant’ around the corner. This feeling came from something else I believe, it felt like this because of was my relationship with Him. Over a period of time, I had gotten into the habit of mentally conversing with Him, whilst driving, at home, and sometimes even at work. He had become my best friend, my companion. At home, I was trying to get into the habit of meditating or attempting to do so in whatever manner I thought meditation was back then. I would sit in the prayer room and list out all the things I was grateful for, big and small. Most times I would eventually get distracted or start worrying about all my future and all the unfulfilled desires, since my fictions self had to have the perfect life. I hoped God would fulfill them soon. What was taking Him so long? Was He even listening? Then I would feel guilty and terrible that I would even have such doubts and hoped all was forgiven. It was always about me and my desires or emotions. But that day was different. I finally understood what they mean by praying from the heart. Thinking about how lucky I was having the family and privileges I did. It suddenly dawned on me that I never really chose my parents, which meant that this life didn’t really belong to me either. Nothing did. Who was I to want or demand this and that? I was nothing but His. I belonged to Him. It was a moment of internal surrender, something that had never really happened before. I naturally fell to my knees and offered myself to Him. He was my Father and henceforth He decides what He wants of this life I was given. It was a very personal prayer and I never spoke of it with anybody. I slowly forgot about it and things went on as normal. A couple of months later, I met a stranger, who was introduced to me as a ‘Yogi Ramsuratkumar’ devotee. It turned out that this person knew of my prayer and was even able to quote it word for word. I was in a complete state of shock as nothing like this had ever happened in my life. A complete stranger knowing details of a prayer that was so intimate and personal, which I had not discussed with anyone, how could this even be possible? Such are the mysterious ways of the Lord. I also realized that it was He who was letting me know that my prayer has been heard by Him and answered too, that I was under His care and protection henceforth. I am very, very happy if I be allowed to share with you just a small fragment of the almighty Grace and Blessing’s of my dear Father, Yogi Ram Surat Kumar. Surely, it is true that my life has been showered with His Grace and here, just now, I would like to share with you just one tiny piece of His Infinite Divine Grace, Humour, Kindness and Love. Yet let it be known, the truth of it is, really, that without my Father’s Grace, I would not be here to even tell this one single tale. And in this Light, to share with you a little of my experience of Yogi’s blessings, what is there really to say? I owe everything, every breath to my Father! It is also true that my faith has wavered, that sometimes I have even forgotten to call my Father’s name, but still He has not forgotten me. And perhaps this alone is the greatest of the many, many blessings that He has bestowed on me. Long Live Yogi Ram Surat Kumar! It was a difficult day. Hot and dusty, in that sweltering, mid summer, southern India kind of way and I had left everything too late. I had too much to do. My funds were completely depleted, I had overstayed and spent everything apart from the exact monies necessary to pay for the journey to the Indira Gandhi international airport. No chance of a taxi ride to Chennai, a bus would have to do. I didn’t want to leave. I lingered over tearful good-byes with my dear friends, who through good sense, and Father’s Grace, would stay to live close to the Mountain. So it was on that day I delayed too long and before I knew it there was only a few hours until the scheduled departure of the train. Leaving the ashram behind me, I urged the rickshaw driver to ride faster and he obliged. We reached the downtown bus stand in Tiruvannamalai in record time. But it wasn’t going to be enough. I missed the early bus departure. I sat around in the heat, nervously looking at my watch, sweating. I gulped at my water bottle. The next bus wasn’t for half an hour which by my calculations left could just get me into Chennai in time for the scheduled train departure, just, if there were no delays on the road and the central Chennai traffic was clear. Unlikely, I thought, despondently. But maybe. I managed to scramble onto the next departure for Chennai. I chose to sit with my bags inside but the bus was heaving, full to capacity and some more. Men pushed, women sweated. Last minute purchases of fruit and water exchanging hands through open windows. The bus driver gunned the engine, horned exuberantly and we were off. I checked my watch again and grimaced, not enough time, nowhere near enough time, I thought. On and on we drove. These were the days before the dual carriageway had been built which now cuts the Chennai run in half. It was taking too long, I thought, eyes hardly leaving the dial of my watch. It was now clear that I was late, really late and it was going to take a miracle to get me to the train on time. We were somewhere near the outskirts of the big city and suddenly a dense fog descended on the road. The bus driver slowed down to accommodate the new driving conditions. I grew desperate, “He’s slowing down!” I yelped. I got up from my seat, pushing aside my concerned looking neighbours. Muttering wildly, I scrambled and shoved through the throng to the front of the bus. “Look!” I commanded the driver, “I have got a train to catch and at this rate we’re going to miss it! Get a move on!” The startled bus driver looked up from his wrestling with the steering wheel, I guess this model didn’t even have power steering, his brow furrowed, sweat pouring down his face from the concentration of his efforts to steer this metal monster through the assault course of the Indian Highway. I was suddenly overwhelmed by an urge to get off the bus. I was in the middle of nowhere I could recognize and a thick fog still shrouded the bus, which was now stationary in standing traffic. Still reeling from the incident with the bicycle, I yelled at the driver to let me down from the bus. Throwing my bags out, I half staggered, half fell into the road. I had no plan, I only knew I felt deeply sick and shocked by what had happened and I wanted to get out from the bus. I was only vaguely aware of the time but I knew it was very late and that it would now definitely take a miracle to get me to the station on time. Just as I stood up and collected my bags, a rickshaw pulled up beside me. It was empty. Without any hesitation I climbed in and told the driver to take me to the rail station. Again, I told the driver to drive as quickly as possible. But this time I took my Father’s name and I asked the driver to take care. The driver took off at full tilt. I started to sing Father’s name, “Yogi Ram Surat Kumar, Yogi Ram Surat Kumar, Yogi Ram Surat Kumar, Jaya Guru Raya!” The rickshaw sped along, darting through the stationery lines of traffic. “Yogi Ram Surat Kumar, Yogi Ram Surat Kumar, Yogi Ram Surat Kumar, Jaya Guru Raya!” I sang, as the rickshaw swerved and tucked in behind a slow moving lorry. I sang and sang and sang. The fog cleared and there, right before me, Chennai Central Rail Station. Time check, the train was leaving in 30 seconds. Within moments of my sitting down in the third class carriage, the train pulled off again. It can’t have been more than 30 seconds. It was then that I realized that I was both exhausted and trapped in this carriage, my berth was a few carriages down the train and there was no way through. Not to worry, the other passengers comforted me, I could hop down at the first stop and move along to my allocated space. Which is exactly what I did? I found my bed and collapsed into a deep sleep. “Please, go in,” the boy indicated. I knocked and when prompted from within, entered. The cabin was dimly lit and sparsely furnished. A copy of a calendar from Durga Printers swung from a hook on one wall. On another, a small altar housed an icon of Hanuman and Krishna, on which a colored bulb flickered. The train supervisor was dressed in a dark suit and white shirt, slightly yellowing at the cuffs. His moustache drooped over his upper lip and his dark eyes looked sullen, depressed. “Are you the Englishman? Are you the fellow who missed the train today?” He asked. “Yes sir,” I replied. “Yes, that’s me.” I had no clue what to expect next. “Oh, sir!” the Supervisor’s face suddenly became animated in a sea of emotion. “I cannot believe it sir! I don’t know what to do. I don’t know what to do. I am deeply unhappy, sir!” He turned to look at me full in the eye, clutching at his hands with nervous wringing. “Forty five years of service sir, forty five years!” I was perplexed, becoming slightly nervous myself at this unexpected and unusual interview. I was confused. I was not sure quite what was going on. As far as I was concerned, I had missed the Express train to Delhi but by some miracle it had stopped just as it left the platform. I was still of the understanding that the train had been stopped for this mad, cursing Englishman, that it had been stopped to save injury in my making a last bid attempt to board a moving train. “Never before sir, not in forty five years of service. Never have I done anything so foolish. You see I had to stop the train because I left my briefcase, with all the train registers and everything, right there on the platform! I just don’t understand sir, I cannot understand how this thing happened.” The Supervisor looked at me with a great sadness. “Don’t worry, don’t worry,” I said, smiling. “This is not your problem, not your problem at all! We will tell your supervisor’s that you stopped the Express train to help me, that it was simply an act of good service since you could see my desperation to catch the train. Bring me some paper and I will write a letter for you, I’ll write it all down, I’ll tell them everything. Please don’t worry, don’t worry at all.” Yogi Ram Surat Kumar, Yogi Ram Surat Kumar, Yogi Ram Surat Kumar, Jaya Guru Raya. I humbly offer this experience at the feet of my Master. Thank you. A million times thank you. Long Live Yogi Ram Surat Kumar!